This week, we had a special guest. My mother-in-law. She picked the theme and became the special judge. She chose three items and gave me half a day to come up with a delicious meal. My note : When my mother-in-law told me the three ingredients to use, Asian food came to mind. No real strategy - just instinct. I had to clear the hardest part first: Kiwi. Kiwi is sweet and tart so I thought it would be great to use it for some kind of sweet and sour sauce. Sweet and sour sauce made me think of a Vietnamese Nuoc Cham. So, I made a kiwi juice and substituted it for lime juice for a Nuoc Cham. The rest of the menu was very easy after that. 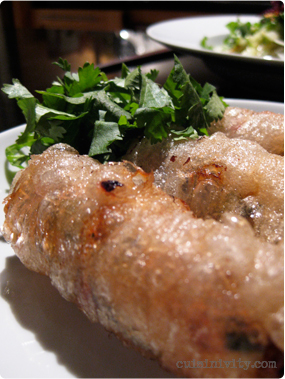 With Nuoc Cham, spring roll (Nem) was the way to go. Nem is usually made with pork but I grounded the chicken thigh then combined with boiled beet greens to make the meat patty for the Nem. However, I still needed to go one more step further with the beets. 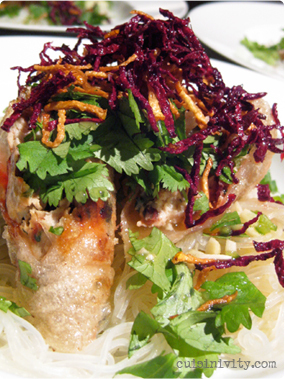 I planned to serve Nem over rice noodles with lots of cilantro so I thought crunchy beet chips on top would give the dish color, texture and fun. I was quite happy with the result. I thought it was tasty and I had a lot of fun making this dish. Special judge's verdict : Yuko really threw me for a loop. I consider dark meat the most flavorful part of poultry, and since I had read reviews of sauces created for previous challenges, I expected an original and perhaps exotic sauce to grace the thighs. And I am quite fond of beets, so I was eager to get ideas beyond my usual boil/roast routine for these veggies. The kiwi was basically thrown in for a kind of joke. While Challenge menus and preparations are usually secret until the meal is presented, I was granted permission to observe the cook during the preparation. What impressed me from the start was, in spite of a large library of cookbooks, she created this meal totally without recourse to anyone’s ideas but her own. The result was Asian in concept, with all the lightness that suggests, rather than the heaviness that would have characterized most other ideas for this food combination. And to top it off, beautifully presented in individual shallow bowls. Suffice to say, my expectations were far exceeded, in creativity and taste. It was a meal that could have stood up to any in the highly-reputed restaurants we had visited in the previous days.